1 1/2 inches high, chain not included. Matching 18 inch chain is available below. Each key is engraved with the member's name, chapter, and calendar year of election. For the member's name, a maximum of 16 letters and spaces can be engraved. Chapter names are engraved in accordance with instructions on file at the Society. 1 1/2 inches high. The pin finding is permanently attached to the back of the key. Each key is engraved with the member's name, chapter, and calendar year of election. For the member's name, a maximum of 16 letters and spaces can be engraved. 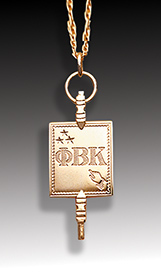 Chapter names are engraved in accordance with instructions on file at the Society. 1 3/8 inches high, chain not included. 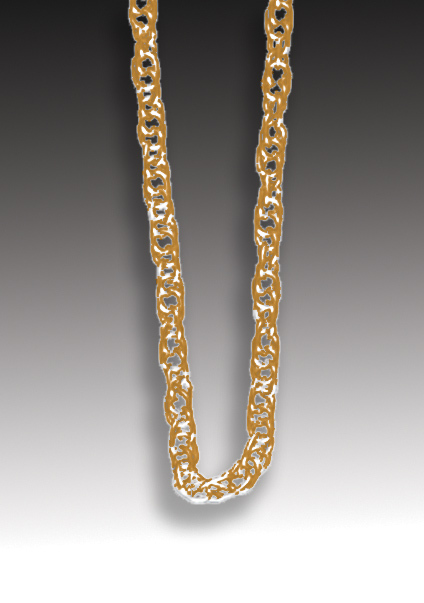 Matching 18 inch chain is available below. Each key is engraved with the member's name, chapter, and calendar year of election. For the member's name, a maximum of 16 letters and spaces can be engraved. Chapter names are engraved in accordance with instructions on file at the Society. 1 3/8 inches high. The pin finding is permanently attached to the back of the key, as shown. Each key is engraved with the member's name, chapter, and calendar year of election. For the member's name, a maximum of 16 letters and spaces can be engraved. Chapter names are engraved in accordance with instructions on file at the Society. 1 inch high. Chain not included. 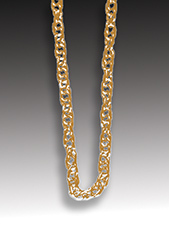 Matching 18 inch chain is available below. Each key is engraved with the member's name, chapter, and calendar year of election. For the member's name, a maximum of 16 letters and spaces can be engraved. 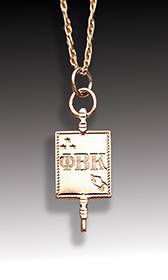 Chapter names are engraved in accordance with instructions on file at the Society. 1 inch high. The pin finding is permanently attached to the back of the key, as shown. Each key is engraved with the member's name, chapter, and calendar year of election. For the member's name, a maximum of 16 letters and spaces can be engraved. 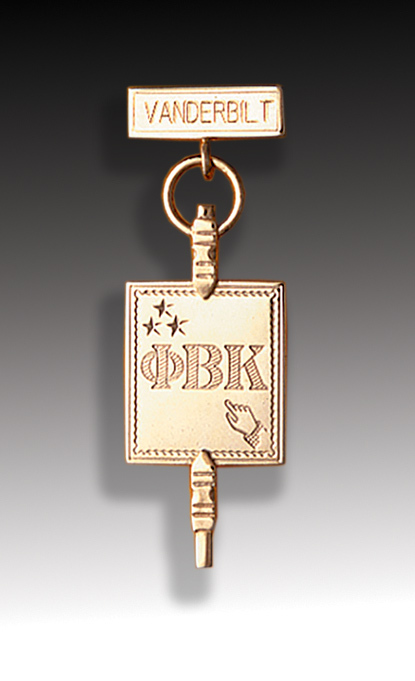 Chapter names are engraved in accordance with instructions on file at the Society. Overall height 1 1/2 inches. Wear a key as a pin. The bar is engraved with the name of the member's college name on the bar. The pin finding is permanently attached to the back of the bar pin only. Each key is engraved with the member's name, chapter, and calendar year of election. For the member's name, a maximum of 16 letters and spaces can be engraved. 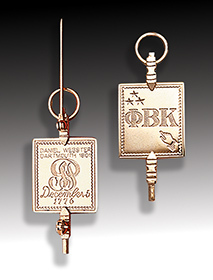 Chapter names are engraved in accordance with instructions on file at the Society. Overall height 1 3/8 inches. Wear a key as a pin. The bar is engraved with the name of the member's college name on the bar. The pin finding is permanently attached to the back of the bar pin only. Each key is engraved with the member's name, chapter, and calendar year of election. For the member's name, a maximum of 16 letters and spaces can be engraved. 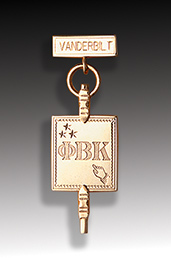 Chapter names are engraved in accordance with instructions on file at the Society. 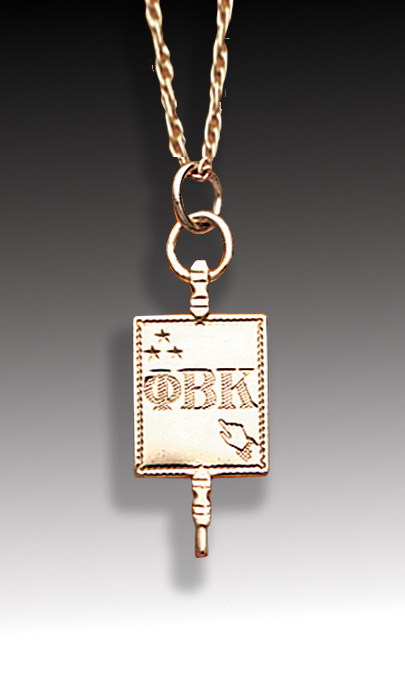 18 inch Neck Chain available in 10k gold or 24k gold electroplate to match your Phi Beta Kappa key. 1 inch high. Post pin finding for lapel. Engraved with the member's name, college and year of election. 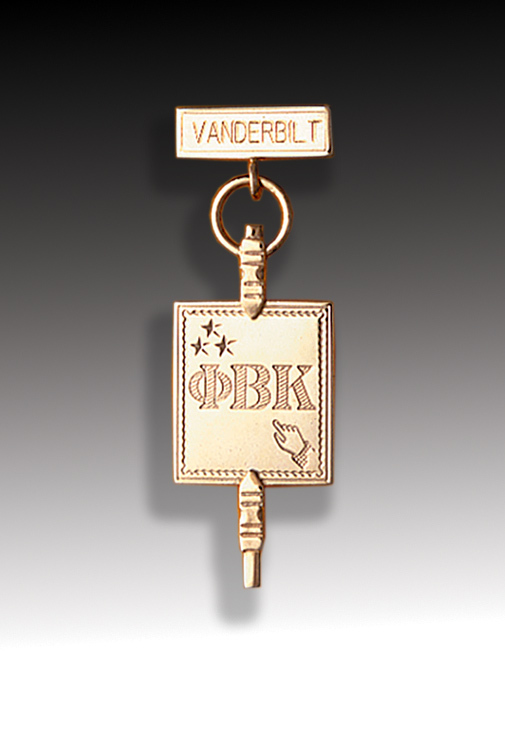 Each pin is engraved with the member's name, chapter, and calendar year of election. For the member's name, a maximum of 16 letters and spaces can be engraved. 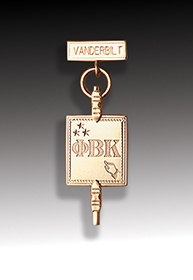 Chapter names are engraved in accordance with instructions on file at the Society. 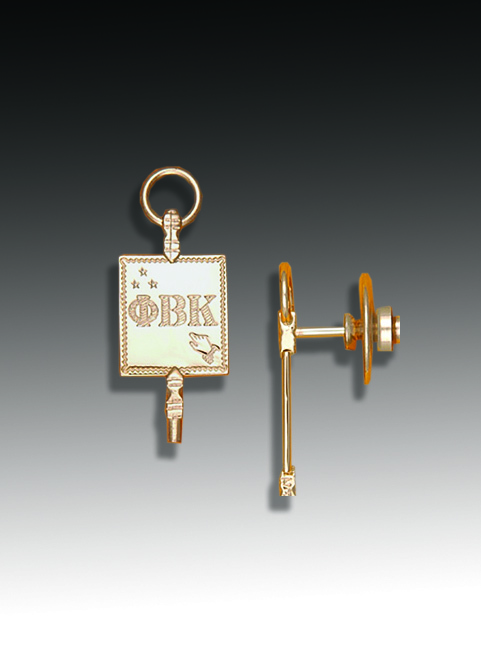 Phi Beta Kappa keys are made to the standards specified by the Society and are available in three different sizes. 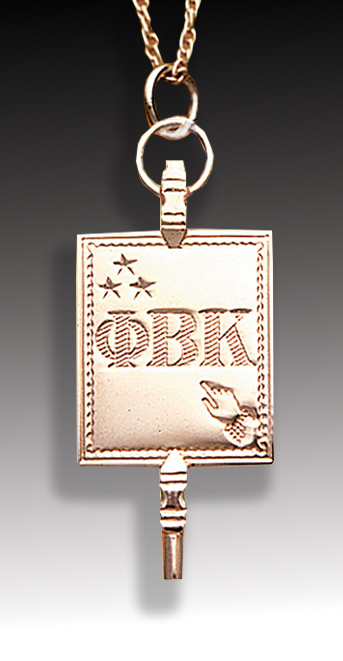 Each is available in either 10 karat solid gold or 24 karat gold electroplate. Each of the three key sizes is available as a key pin. The key pin has a finding permanently attached to the back of the key. 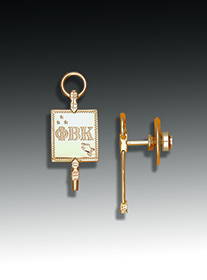 The bar pin is also available which is engraved with the member's chapter. Bar pin/key combinations are made in two sizes. Keys are sold without chains, which are available separately. Each key is engraved with the member's name, chapter, and calendar year of election. For the member's name, a maximum of 16 letters and spaces can be engraved. 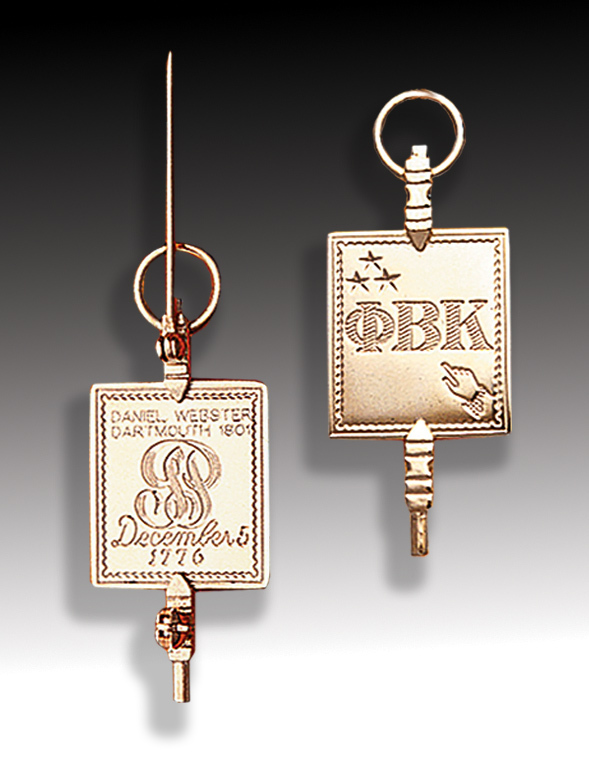 Chapter names are engraved in accordance with instructions on file at the Society. Personalized items cannot be returned.